At the Buffalo County Democrats meeting that Chair Jane Kleeb attended, a fellow Democrat gave a great suggestion to have us put online info they can use on Facebook, at BBQs to counter misinformation on various topics and to write letters to the editor of your local papers. Here is our first one on health care! 1. Read this great fact sheet on what the GOP TrumpCare bill does to Nebraska. 2. Write a letter to the editor of your local paper. Elected officials read these often and it is a way to get your voice heard. 3. Call your Members of Congress. The DNC has a great look up tool and gives you talking points on the screen. We suggest asking a specific question and asking the staff person to send a response to you via mail or email. Leave them your mailing address. The GOP Senators may try to force a vote on the health care bill before July 4th. The CBO usually takes 2 weeks to score a bill (essentially how much the bill will cost). Our team did get Fischer on camera at the last town hall to say she would not vote for the bill unless there was a CBO score. Democratic Senators held an all night floor discussion on the risks of taking away health care for over 23 million Americans. * From 2010-2015, under the Affordable Care Act, 62,000 Nebraskans gained coverage and the rate of Nebraskans without health insurance dropped by more than a quarter. 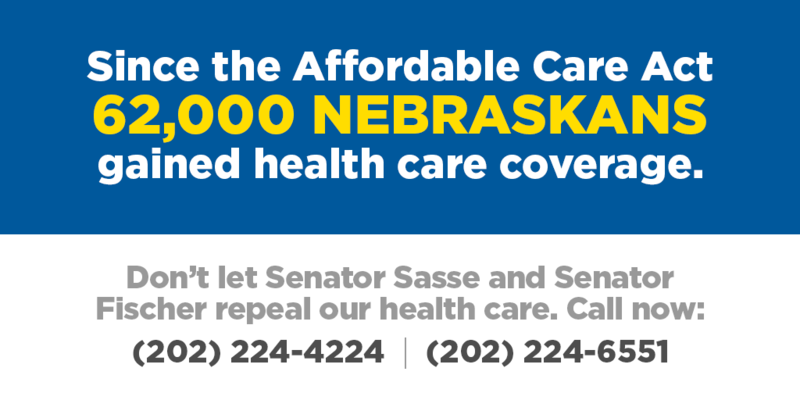 * Before the ACA went into effect, as many as 767,000 Nebraskans with pre-existing conditions could have been denied coverage. * The Republican health repeal plan would slash Medicaid, jeopardizing services that cover over 230,000 Nebraskans, including 1 in 3 who have a disability. * The GOP health plan’s cuts to Medicaid in Nebraska and per capita cap could jeopardize services for people with disabilities who utilize home and community-based services under the program. * Low-income and rural residents would suffer heavily under the Republican repeal plan, which increases costs and slashes spending on Medicaid. * Hospitals in rural areas would be in danger of closing thanks to the GOP repeal’s massive cuts to Medicaid. *Defunds Planned Parenthood for one year, making it more difficult for millions of women to access critical health services. * Gives states the ability to waive protections that guarantee coverage for maternity care and birth control. *Bars the use of premium tax credits on health insurance plans that cover abortion, meaning women would have to fully pay out of pocket for supplemental coverage. *Slashes Medicaid, which covers half of all U.S. births, funds two-thirds of all spending on family planning and provides access to women’s health and reproductive services, including cancer screenings. * Slashes Medicaid, which is responsible for treating 34% of those struggling with opioid addiction. The end of the Medicaid expansion would also have an outsize impact on states that have been hit hard by the opioid epidemic. * Dedicates an inadequate amount of funding for opioid abuse treatment for just one year, in a pitiful attempt to make up for the impact of the Medicaid cuts. * Allows states to waive essential health benefits, which cover substance abuse and mental health treatment, leaving patients to pay more for supplemental coverage that provides the services they need. * Slashes funding for Medicaid, which currently provides coverage for nearly two-thirds of nursing home residents. *Reduces federal assistance for premiums, which would cause some people to pay the full cost out-of-pocket and have a disproportionately negative impact on older Americans from rural areas. * Allows states to waive essential health benefits, effectively allowing insurers to offer watered down plans. This means that there could no longer be a guarantee that plans offer many of the basic services that people who are sick utilize often, like coverage for prescription drugs. * Ends federal subsidies that help insurers keep premium costs lower, which by itself could cause double-digit hikes in premiums. The impact would be especially bad for middle-class consumers who make too much to qualify for any sort of federal assistance to help cover their costs. * Ends the ACA’s Medicaid expansion, which provided coverage for more than 11 million low-income Americans. As a result, those who can no longer obtain this coverage would have to pay more for less coverage in the individual marketplace. Rural areas, which have a higher proportion of uninsured Americans than cities and have hospitals that rely heavily on Medicaid funding, would be particularly hard hit by the GOP’s attack on the program. Covers almost 40% of children in America and provides exceptional coverage for those with special needs. Provides approximately half of the funds that children’s hospitals collect on average. Serves people with disabilities who rely on the program to help cover their home- and community-based services that allow them to live independently. * It also would allow for waivers of essential health benefits, which include pediatric dental and vision care, as well as screenings for autism and vaccinations for diseases like Measles, Whooping Cough or Chickenpox.